Hello friends! Happy Wednesday! This is the beginning of my week, since Dustin went to work today. Nothing big planned today and I'm hoping to not be so darn tired. 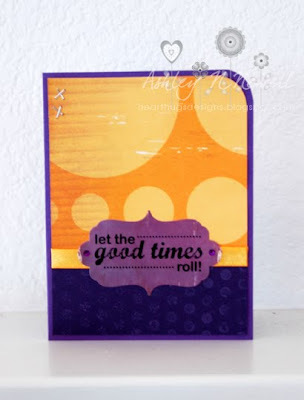 I made this card for my friend Carole's VSN challenge and I used the Card Positioning System's sketch from this week. However, I totally FORGOT to link it up to VSN on time. Whoops! Guess I have too much going on! The yellow paper and sticker are Cosmo Cricket from Snorkel. The dark purple card stock is stamped with Unity's Distress Dots. I added a couple staples from my Tiny Attacher and I rounded the corner with my EK Success corner rounder. Have a great Wednesday everyone! And check out Jenny's giveaway HERE. Awww man Ash...I hate when that happens. If you had thrown in a bit of hot pink, you could have put it in The Cafe as well....hope to see you there this week. The card is really cute, though...you did a great job on the sketch. love, love the colors...such a striking card! Love it! The colors are great together and I LOVE the sentiment! Hope you had a good, energetic (?) day!